Sun., Dec. 17, 2017, 7 a.m. Growing up in El Salvador surrounded by beautiful Spanish colonial buildings, Romeo Herrera aspired to become an architect. But with a civil war raging, he fled to the United States at age 16 and took the first job he could find – working in a Los Angeles restaurant. Nine years later, Herrera was running the restaurant, preparing organic meals for appreciative clients, including Hollywood celebrities. “I had everything in L.A.,” Herrera recalled. “I was making good money, and drove a 280ZX with a T top. I was on the way up. True to his name, Romeo (pronounced row-MAY-oh) relocated for love. 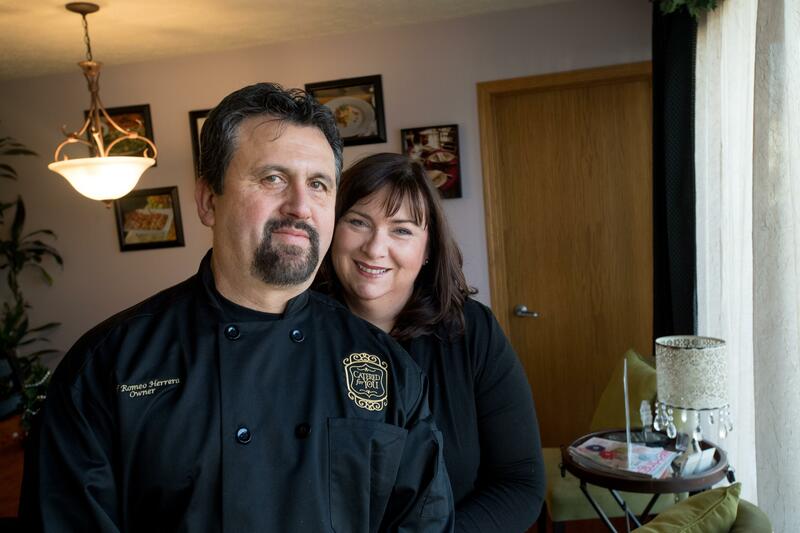 Today, he and his wife, Linette, own Catered For You, the Better Business Bureau’s 2017 “Business of the Year” for the Eastern Washington/North Idaho region. During a recent interview, the Herreras discussed their circuitous route to success, the “bacon bandwagon” and ways to save money when hiring a caterer. S-R: Romeo, describe your journey to the United States? Romeo: I left El Salvador the first time when I was 15 and worked aboard a merchant ship. When we reached New Orleans, the ship was sold and we were sent home. But just being in New Orleans a little while made me think, “I want to come back.” So the next year I did. Once I got to L.A., I started working at a natural-foods restaurant in the Beverly Hills area and learned really fast. S-R: Had you cooked back home? Romeo: No, but I was used to a lot of good food coming out of the kitchen. My mom and my grandmother were amazing cooks. Romeo: I trained with a really great chef from Taiwan. I learned so much that when the owners decided to open another restaurant, the chef left me in charge when I was 22. S-R: How big was the restaurant? Romeo: It seated 45. We specialized in organic food and served famous people almost every night – Sylvester Stallone, Madonna, Olympia Dukakis. S-R: Did you meet them? Romeo: Some. They would come into the kitchen and say, “Thank you very much,” because they knew I tried to do dishes exactly the way they liked them. For instance, Marilu Henner (from the TV show “Taxi”) wanted her swordfish just warmed, and other places would overcook it. S-R: Where did you grow up, Linette? Linette: In Sandpoint, Idaho. I moved to Spokane to attend SFCC. S-R: What career did you envision? Linette: I wanted to study flute and voice. I was really involved with liturgical music, and traveled in the summer with a small group called Catholic Life Singers. But once I realized I had bills to pay, I switched to Kinman Business University and got a job at the front desk of an alcohol rehab center. It was a very stressful environment. I left after a year and went to work at Kinman as a sales assistant. S-R: How did you two meet? Linette: After my Kinman experience, I worked for a big computer company for quite a long time. Meanwhile, a friend of mine from Catholic Life Singers got married, and when she had her first baby, she asked me to be the godmother. One of her husband’s friends was coming from L.A. to be the godfather. We met the night before the baptism – I was 24 and Romeo was 25 – and as soon as I saw him, I thought, “That’s it!” Later that year, he left his glamorous life in L.A. and moved here, and we got married exactly one year after the day we met. S-R: Did local restaurants roll out a red carpet for you? Romeo: No, no, no. I went to work at Percy’s, which served straight-forward, diner-type food. That was a serious adjustment. So after a couple of years, we went back to L.A., and I ran a little deli in Beverly Hills for four years. Linette: By then we had our first baby, a second one was on the way, and L.A. was a mess – the Rodney King riots. So we moved to Seattle, which was our compromise city. S-R: How long were you there? Romeo: … and the Small Business Administration. They helped us a lot. S-R: What was the business like when you bought it? Linette: Sheila had a following and good-quality food. But when Romeo started working for her, the business began to grow, and I think that was the impetus for her to think, “This is someone who can take over,” and feel good about it. S-R: Did you want to keep doing what her customers had come to expect, or take the business in a new direction? Romeo: Both. I didn’t want to lose her clientele. But at the same time, I saw an opportunity to offer a broader range of services and a greater variety of foods. S-R: What skills learned in earlier careers did you bring to Catered For You? Romeo: I brought a more international cuisine to the business – French, Italian, Chinese. Linette: And I brought tons of business experience, as well as my background teaching technology. I was able to convert the company from paper and pencils and carbon copies to full automation. S-R: How has the business evolved since 2000? Linette: I’ll never forget when the recession hit. It was around the holidays, and people started calling, saying, “Our East Coast division laid off 50 people, so we can’t have a Christmas party.” Almost overnight, revenue fell by half. S-R: Did you think the business might fail? Romeo: I did. She was more optimistic. Linette: There was no way I was going to let it fail. S-R: What lessons did you learn? Linette: Don’t take anything for granted. We learned to operate more leanly – take on more responsibilities ourselves and demand more from our employees. S-R: How is business today? Linette: It’s better. There’s breathing room. But it’s been a slow recovery. S-R: What services do you offer? Linette: Everything from a simple food drop-off to complete packages – event planning, rentals, servers, DJ, dance floors. S-R: What’s your most popular service? Linette: Hors d’oeuvre parties for 20 to 400 guests. S-R: Why were you named the BBB’s Business of the Year? Linette: Because the values the BBB promotes are integral to our business – honesty, integrity. We treat our customers and employees the way we want to be treated. S-R: What’s some good business advice you got along the way? Linette: Before we bought the business, a SCORE volunteer encouraged me to write a really in-depth business plan. I think a lot of people don’t devote enough time to that. S-R: What’s your busiest time of year? Linette: Summer, when most weddings happen. S-R: How long can your workdays last? S-R: Are wedding receptions getting more elaborate? Linette: They are nationally, but not so much in Spokane. People here still have a potluck mentality. S-R: Which foods are in or out? Linette: I wish bacon would go away. The bacon bandwagon has been so overdone. S-R: What advice would you offer clients who want to stretch their catering dollars? Linette: If you don’t have money for filet mignon, there are other cuts of beef that are delicious and beautiful. Or use steak as an element with some vegetables and rice or pasta, just like you’d do at home. And don’t get caught up with pictures or what you think your guests will expect. Be willing to go outside the box. Romeo: Also, people think hors d’oeuvres are cheaper, and they’re not. Hors d’oeuvres are very labor-intensive. A nice chicken and curry meal may cost less. Linette: Besides, if a party goes from 5 to 10 at night, a couple of hors d’oeuvres aren’t going to work anyway. S-R: What do you like most about your job? S-R: What do you like least? Linette: Financials can get very stressful. S-R: Looking back on 18 years as business owners, what’s been the biggest surprise? Linette: How hard we work. When I was in the corporate world, I longed for the day when we could work for ourselves and set our own hours. But we never worked this hard for anyone in our lives. Romeo: The big surprise for me was the recession. That took a hit on my health. S-R: What has this job taught you about yourself? Romeo: It’s taught me to be more creative. Linette: It’s taught me that I can pretty much do anything I put my mind to. S-R: What are some misperceptions about this business? Linette: When people find out what I do, they say, “Oh, that sounds like fun,” or “Do you do that out of your house?” Most people have no idea what full-service catering involves. Also, people think catering is less expensive than going out to eat. And it’s absolutely not. Romeo: We’re bringing you the food. S-R: What’s the business outlook for your industry? Linette: Good, because interesting, beautiful food is more popular than it used to be. S-R: Romeo, do you miss the glamour of L.A. – Stallone poking his head through the kitchen door and shouting, “Yo! Nice meal”? Romeo: (laugh) I did for a while. But now I feel really good about what we’ve accomplished here. Writer Michael Guilfoil can be contacted at mguilfoil@comcast.net. Published: Dec. 17, 2017, 7 a.m.